What an ugly month for the stock market. The total stock market index was down over 8% for the month. On the plus side I finally was able to have my portfolio's return match the benchmark, a small achievement, at this point I'll take what I can get. Big dividend month with most of the companies we hold paying dividends (Pfizer, Wachovia, Anheuser Busch, Exxon, Johnson & Johnson). 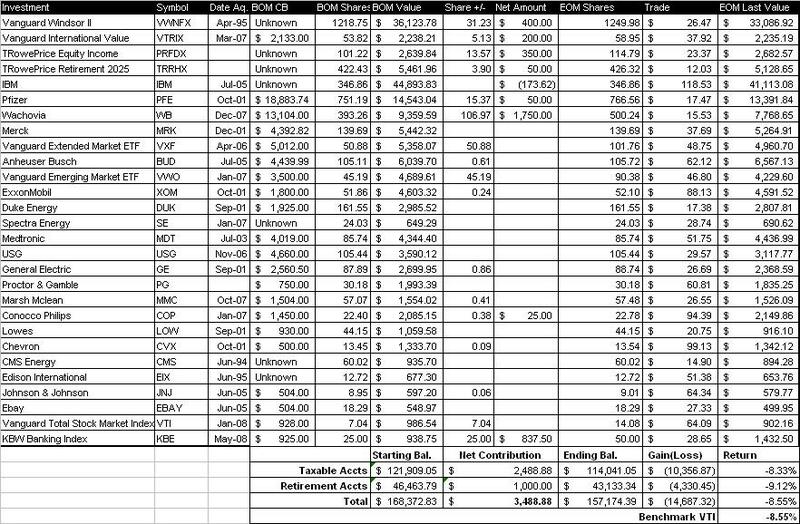 GE paid a dividend in May, but didn't record it so I have added it to this month's report to try and keep up with it. On that note, I don't have easy access to a couple holdings (Duke, Spectra, PG, Medtronic, etc) so I am currently not recording dividend payments/reinvestments for those holdings. I will have ot figure out a way to handle this once I get back to the US and get this information. The Vanguard ETFs (VWO, VXF, VTI) all split 2for1 in June. I added more to our Wachovia and KBW ETF investments. The financial industry bloodbath continues with no end in site. I don't know what will happen, but I'm drooling over the valuations. Have you tried using Yodlee to track your 401k? It might let you add your investment that way then you can pull once a month to get the values. 2mil, you still appear to own a hodge podge of investments and your return matching the benchmark seems to be a coincidence rather than an achievement. Why do you think that anything you did made your portfolio investment returns match the VTI return?